I just returned from a visit to Arizona. The region provided an incredible number of photography opportunities. 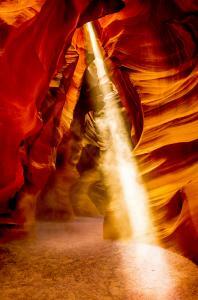 The image above was taken in Antelope Canyon in northern Arizona. Antelope Canyon is located in the high desert region in the middle of the Navajo Indian Reservation. It can only be visited with a Navajo guide. The canyon is incredibly narrow and the walls are made of sandstone. At certain times of the day, the light filtering through from the narrow opening at the top causes the sandstone walls to light up like they were on fire. Check out some of my images that I took that day (go to Galleries | Landscapes in the menu system above). When I was in Arizona, I also visited Sedona, the Grand Canyon and the last remaining part of the old highway Route 66. Arizona had other attractions that I also found interesting, such as an incredible number of old vehicles just lying out in the desert sun. I also passed through Las Vegas to catch my flight home. I am not a gambler, but Las Vegas certainly provides many opportunities to photograph some amazing neon signs. The city must be the neon sign capital of the world. Over the next couple of weeks, I will be posting some of the images from this trip. Check back often to see the latest photographs.